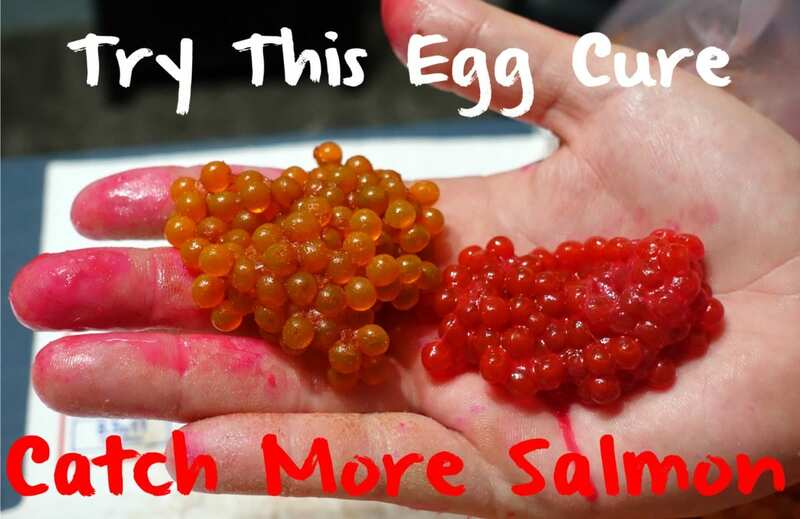 I’ve been fishing with the same egg cure recipe for the past two seasons and it’s helped me catch salmon daily. However, a few weeks ago my fishing partner came to me and told me he had an egg cure better that others I’d experimented with. Instead of using Fire Cure with BorX O Fire like we both had for years, he had been mixing Fire Dye with BorX O Fire. His eggs looked incredible and were catching a ton of fish so I started experimenting with it. 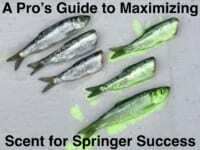 New methods can improve your catch rates. I figured curing up some eggs with Fire Dye would give me a new presentation that these fish hadn’t seen before and actually underestimated the success I’d have with it. This week we’ve already caught dozens of salmon on this new cure. I’m still using my favorite Fire Cure recipe for salmon, but also bringing this one and alternating between the two. Make sure to start with blood free, fresh eggs. Many anglers make the mistake of not bleeding the salmon right when it’s caught. Bleed the fish right away in order to allow the blood to be pumped out of the fish. Otherwise, you’ll have blood in the skein. Either take the entire skein and place it in a Ziploc or cut the skein into fishable pieces (like I do) and then place in the bag. Pour roughly a half bottle of Fire Dye into the Ziploc. I like to squeeze in enough to cover the eggs. However, you can use one-third of a bottle and then massage the dye into the eggs after sealing the Ziploc. (Above) Red Fire Dye being squeezed into the Ziploc. Shake the bag, tumble the eggs in the bag and help the Fire Dye get into every fold of the skein. Then let the Fire Dye rest in the bag for an hour. (Above) Orange Fire Dye staining the eggs. 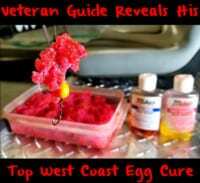 Fire Dye isn’t an egg cure. You are simply dying your eggs during this process. I’ve been using Orange, Red, Pink and Gold Fire Dye for this. Which color you use depends on the clarity of the water you’ll be fishing. After an hour it’s time to reopen the bag and sprinkle on Natural BorX O Fire. I use natural because it doesn’t change the color of the eggs. BorX O Fire is your vehicle to cure the eggs. Again, Fire Dye isn’t a cure. Make sure to use enough BorX O Fire to coat the skein and shake it on both side of the skeins. BorX O Fire will toughen up the eggs and dry them out. Lately I’ve also been adding a step courtesy of guides from out West. Salmon are big krill eaters. Fire Power is 100 percent powder krill so I’ve been adding a healthy dusting of Fire Power to my eggs during the curing process. The scent is critical to success. After that let the eggs sit for 12 hours and they’ll be ready to fish. I’ve been using this cure for about a week. It’s hard to tell if this is going to become my favorite cure, but it’s been my go-to cure this week. Many of you saw us Go Live on Facebook Wednesday. All the fish we caught that day (all but about three of 25) were on Red and Gold Fire Dye. What I do know is having eggs that don’t wash out, but still milk is incredible. We didn’t fish any of them for longer than 30 minutes (without getting bit) and through that time the eggs didn’t lose their color. The Fire Dye stains them to the point they retain color better than I’ve ever seen. I’ll be using this cure daily, but will continue to bring a bag or two of my Fire Cure skein, too. It’s always best to give the fish options. *Fire Dye is available in many Walmart stores, Cabelas Canada, at some Bass Pro Shops and online at Amazon.com & Amazon.ca and FishUSA.com. Editor’s Note: Kyle Deavers operates Big Boy Fishing. For more info on his shore fishing Wisconsin salmon trips please visit https://www.facebook.com/Bigboyfishing.